Review: Harry goes to destroy the Horcruxes while on a race against time. I am sorry but I was just bored all the way through this film. I really didn’t enjoy it. Found it too long. There were over 500 wands created for this film. They were all checked out and checked in before, during and after the filming day is completed. Many of them came back broken. This is the only Harry Potter film that Industrial Light and Magic did not provide visual effects for. 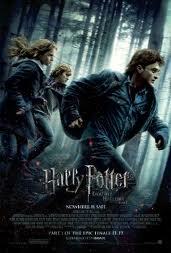 The only Harry Potter film that does not feature Dame Maggie Smith (Professor Minerva McGonagall). This series is on Barry Norman’s list of 100 Greatest Films of all time that he produced at the start of 2012 in The Radio Times.